Chelsea Clock is pleased to announce that it has reclaimed over 80 marine mechanical clocks previously installed on Victory Ships built by the U.S. Maritime Commission during World War II. These authentic military timepieces, produced for the U.S. Government in the 1940s, are being returned to optimum working condition by Chelsea’s certified Repair & Restoration technicians. As each piece in the Vintage Victory Collection is restored, it will be made available for purchase in the Vintage Collection section on this site. In 1943, the U.S. Maritime Commission embarked upon a program to develop a new type of emergency ship that would replace those lost to German submarines during the early part of WWII. Dubbed the “Victory” ship, the new vessel was designed to be faster than its predecessor, the Liberty ship. The Victories were given the designation of VC2: V for Victory (ship type), C for cargo, and 2 for a medium-sized ship between 400 and 450 feet long. The first Victory ship, the S.S. United Victory, was built at Oregon Shipbuilding in Portland and delivered on February 28, 1944. A total of 531 Victories were constructed by North American shipyards, comprising 414 cargo ships and 117 attack transports. Ninety-seven of the Victories were outfitted as troop carriers; the others carried food, fuel, ammunition, material and supplies. While the lines of the Victory ship were not unlike those of the Liberty, the propulsion was vastly superior. Liberty ships were powered by steam engines, with a maximum speed of 11 knots, which made them easy prey for submarines. Victories were propelled by the more modern steam turbine, generating between 5,500 to 8,500 horsepower and providing cruising speeds of up to 15 to 17 knots (approximately 18.5 miles per hour). American colleges and universities (e.g., SS Adelphi Victory, SS Yale Victory). All of the names ended with the suffix “Victory,” with the exception of the 117 Victory Attack Transports, which bore the names of state counties. These fast, large-capacity carriers served honorably in both the Atlantic and Pacific theaters of war. In our next blog post, we’ll cover the second half of the Victory story, detailing their later years. Well remember seeing the Victories at sea and in port. At sea, they generally overtook us, popping up over the horizon with their unmistakeable cargo gear luffed up to the mast cross trees, for ready use in the next port. As an Australian ship’s Radio Officer I well recollect the big signals from their nicely fitted out radio rooms, and it would be great to have a memento of these ships in terms of a radio room clock in the ham shack. It will remind me and others of the debt we owe to all who served at sea in merchant ships in W.W.II. Well said! All of us at Chelsea Clock are proud to be a part of this history and heritage. We invite you to visit the vintage collection on our website to preview our latest U.S. Victory Ship clocks and to sign up to receive our emails announcing their availability. Thank you. According to our records (based on the serial number you have provided), the 4 ½” Ships Bell clock was sold to Marshall Field & Company on December 20, 1937. The “S’ and “F” markings on the dial refer to the settings on the regulator. Turn the wheel toward “F” (faster) if the clock is losing time, and toward “S” (slower) if it is gaining time. Rotating the wheel one notch will change the rate approximately four seconds per day. It is generally easier to let the clock run for a full week, then adjust the regulator as needed. You may download a PDF of the Ship’s Bell user’s manual from our website, at http://www.chelseaclock.com/customer-service. Do you know anything about this clock? Age, service etc? MY friend does no use the internet and I am a clock collector and member of the NAWCC. We may be able to provide some additional background information about this timepiece if you can provide the Chelsea Clock serial numbers found on the case and movement of clock. Unfortunately, we cannot trace information according to the U.S. Maritime Commission serial number. Hello i just got this clock from my grandfather but i’m searching for the serial number the only thing i can find is 496872 carved in @ the back of the clock. Or should it be elsewhere? Hello Dave, Typically, the serial number is “etched” or scratched into the back of the black phenolic clock case. Take a closer look and see if you can forward that number to us. If so, we can look it up in our manufacturing log and tell you the year it was manufactured and to whom it was sold. But, unfortunately, we would not have any further information on the timepiece. Thanks! How about some information on how, where and when th clocks were “reclaimed”? Hello Chelsea team, I have recently purchased old and very beautiful “U.S: Maritime Commission” Chelsea clock. It looks like that it was recently serviced, because it’s dial looks new (silver color). It has serial #475093 on the mechanism and B-6902 on the housing. It would be great if you could tell the production year and maybe even some more information. Maybe it is even one of your Vintage Collection clocks found here “http://www.chelseaclock.com/pl/vintage-clocks-collection” ? Thank you for reaching out to us at Chelsea Clock. According to our manufacturing log, the clock bearing serial number 475093 was sold to the United States Maritime Commission on March 5, 1945 and it is listed as a 6″ marine mechanical clock. Unfortunately, this is all the information that we have on this timepiece. You may wish to contact the U.S. Maritime Commission for additional information. Thank you ! You are THE best clock company, providing such a service !!!! Here’s what our log book shows or serial number 396663: sold to the United States Maritime Commission on June 29, 1944, and it was listed as a 6″ marine mechanical clock. Unfortunately, that is all the information we see for this serial number. You might try contacting the Maritime Commission to find out more. I have a Chelsea clock (deck clock I think) on the dial is the U S Navy serial no. 40688E the serial no.on the movement is 412847, this number is also scratched in to the back of the case by someone, can you tell me anything about this clock I would be interested to know its history. I have wound it and it runs. Yes, the maritime commission most often added their own serial number to the front of the deck clocks we sold to them. I emailed you the other info you requested. Hope all is well! We have come across a Chelsea Clock in the belongings of our deceased father. Serial number on case 554769. Can you tell me anything about it. I’m looking into this for you and will email you once I confirm with our record books. Thanks for reaching out, and we’re very sorry to hear about your father. How do I determine the date of my Navy ship clock. The serial number is 39125E. Hi, after reading this awesome post i am as well glad toshare my experience here with mates. today i got a really nice clock and now i really would like to know something about the history. Maby you can help me a bit. We have a 6 in Chelsea brass ship clock. It opens from the bottom. The serial number is 668857 etched on the back. Please provide info on this clock. Thank you. Hi, I have a Chelsey Clock Co Boston under the hands. It was my Dad’s. I forgot I had it. It’s been in the garage for 43 yrs. It works! I have been reading everyone’s info. I took it to a clock Co and all he told me was it was from the 1940’s and that the glass wasn’t original. He was very rude. I can’t find a serial # or any number anywhere on the front or back. The back just says Chelsey Clock Co Boston. I remember my dad said it was from a ship or sub. He was in WWll Any help would be much appreciated! My neighbor has an all brass Chelsea Ships Clock. On the face of the clock is is inscribed U. S. Maritime Commission Ser. No. 3515. On the back is another serial number 309051. Can you tell me when this clock was made and if you have any idea what ship it was on? My Chelsea is a family heirloom zig-zag clock complete with ship’s bell that came off the Black Watch II , the boat my dad came downriver from Chicago arriving in New Orleans aboard with his family in 1948. I brought it to Baker-Lyman in N.O. for repairs & was apprised of both its value & its zig-zag function, but also that it’s minus some of its parts. I’ve long since wondered if the Chelsea could ever be restored to full zig-zag function considering that the people at Baker Lyman said the parts are hard to come by. My question: does Chelsea retrofit components needed to get a beautiful historical item back into ship- shape condition? My companion ship’s bell is just waiting to know. Serial # 611533, with a another # marked underneath this, 2b9. It is mounted inside a flip top wooded box and I have the original key in the box. The clock works and is in very good shape. I would like to now any info you can share with me about this clock, including value if possible. My Chelsea clock with the U.S. Maritime serial No.5297 has no serial no. on the back of the case.It is encased in black phenolic. Do you have any info on this clock? Can you direct me to the U.S. Maritime Commission? I have a vintage US Coast Guard ships clock in brass with 1941 and Serial number 677 on the dial. Serial number on the back of the clock is M283438. My understanding is this clock was recovered from a Coast Guard vessel that had sunk off the coast of Italy during WWII. Do you have any information available to share regarding this piece? According to our manufacturing log, serial #283438 is listed as a 6″ Marine Mechanical Clock, originally sold to the U.S. Coast Guard Store on November 28, 1941. Unfortunately, that is all the information that we have on this piece. Thank you! Hello, I picked up a Chelsea Clock Co. ships clock up at a yard sale.The serial number is 752703 ,it says chelsea clock co. and U.S. Government on the inside face. Any info. you can provide would be greatly appreciated .I do not have a key to wind it. According to our manufacturing log, serial #752703 is listed as a 6″ Marine Mechanical Clock, originally sold to the U.S. Navy Dept. on May 29, 1970. You may purchase a winding key from our website at http://www.chelseaclock.com/accessories/clock-keys . Thank you! I have a 6″ clock marked Chelsea clock Co Boston on the upper face & US Maritime commission ser. no below the stem (no serial numbers shown) The clock is encased in thick black plastic. The back of the movement is engraved Chelsea clock co. 455100. On the back of the black plastic case the same # is scratched into it There are also two other sets of numbers scratched into the back of the clock casing. 8522-C and NVV40419. The second V in the second number could possibly be NVY40419 ?? Can you provide any info on ship this clock was issued? reason why no Ser.# is entered on face plate? Any clue to explain the meaning of the other numbers scratched into the back of the plastic casing? According to our manufacturing log, serial # 455100 is listed as a 6″ Marine Mechanical Clock, originally sold to the U.S. Maritime Commission on July 31, 1944. We suspect the other numbers appearing on the case were applied by the Navy or Maritime Commision. Unfortunately, that is all the information that we have on this piece. Thank you! I have a Chelsea Maritime clock that has been in the family for some time. It looks nearly identical to these Maritime clocks, but does not say US Maritime Commision on it. It is roughly 9 inches across. Etched in the back is the number 513797 and PRR, which I believe to be the Pennsylvania RailRoad. Can you tell me anything of this clock? Thank you for your inquiry. Unfortunately, there is no information in our manufacturing log for this serial number. We believe, from your description, that the clock was likely manufactured circa 1946. Thank you! Thank you for your inquiry. According to our manufacturing log, serial #585925 is listed as an 8.5″ Marine Mechanical Clock, originally sold to Baltimore & Ohio Railroad Company on November 17, 1953. Unfortunately, that is all the information we have on this piece. Thank you! Hello I have a victory clock that’s a little over 10″. Its a 24 hour clock exactly the same as your black 8.5″ one that you sold for nearly 1500 restored. I’m trying to figure out if I can track it to a specific ship with the numbers engraved on the back below the brass plate and approximate worth for my insurance. I purchased a Chelsea Ship’s Clock from a ship breaker in Taiwan in the late 1970s. I would like to know how old the clock is and what service it may have seen. I am also interested in having the clock serviced. I lost the key some years ago, so I do not know if the clock still works. The serial number on the back of the clock is 313124. The front of the clock is inscribed US Maritime Commission Ser. No.5065. 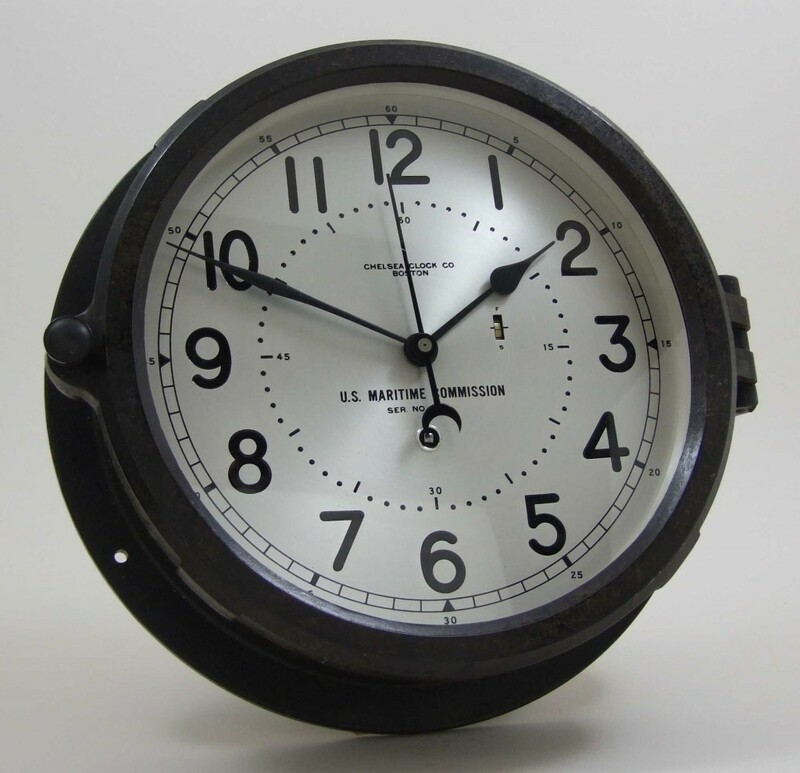 According to our manufacturing log, serial number 313124 was originally sold to the U.S. Maritime Commission on August 24, 1942, and is listed as a 6″ Marine Mechanical clock. Thank you for your inquiry! I am the proud new owner of aGrand Banks 36 and after completing a complete new power plant I am renovating the Salon. I’d love to get some vintage time pieces for the boat and really like the Idea of a US WWII commissioned clock. (My neighbor in the slip Nextdoor is retired 2 star Marine General, so he would love it also). My question is do the Comissioned clocks chime ships bells or not? just wondering as I start my search. I just want to comment on how well the Chelsea Clock was built. In 1970, I removed a Chelsea Ships Bell clock, brass with screw on bezel, from a 1946 C-3 ship that we were scrapping. I have had it installed in my family room since 1970. It has been wound every week, except when away, and it still keeps perfect time. During it’s use on our ships, it had been removed and overhauled a few times, the last in 1970. It was one manufactured for the US Maritime Commission without a MARAD number and I do not want to jinx it by removing to find a Chelsea number. It has been chiming for a full 48 years without as much as a drop of oil, and I think you should know. A true gem of mechanical perfection! Hello, I have in front of me a Chelsey clock that belongs to an old Navy friend of my father; I look after him now that Dad has passed. His clock has 457741 scratched into the back. Looks like a 6” marine mechanical clock. Anything you can tell us about this clock? Also, he thinks he broke it by overtightening it, but your FAQ says this is not likely. Any ideas on how I can “jiggle” it a bit to start working before I return the whole clock to you? Appreciate your help!